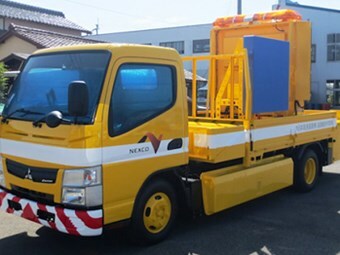 Fuso’s new, zero emissions, electric Canter E-CELL model is currently undergoing testing at MFTBC’s (Mitsubishi Fuso Truck and Bus Corporation) Kitsuregawa Proving Ground in Japan. The vehicle, which is based on the latest conventional diesel Canter light-duty truck model, has a permissible gross vehicle weight of 4.6 tons. The truck also includes a 350 V lithium-ion battery and an electric motor with a maximum torque of 650Nm. The Canter can drive over 100km with a full battery, and can charge in 100 minutes with a 50kW fast charge, or in 12 hours with a normal 200V charge. Later in the year, the truck will be delivered to Central Nippon Expressway Company Ltd. (NEXCO Central) where it will undergo verification for its fast-charging system. The system is named ‘CHAdeMo’, and is the equivalent of a petrol pump for electric vehicles. In Australia there is currently only one CHAdeMo station, located in Adelaide. Fuso’s first Canter E-CELL premiered in Germany back in 2010 and according to a Fuso media release was designed to "work towards achieving emissions-free mobility in densely populated areas and environmentally-sensitive areas." As part of their "Leader in Green Innovation" strategy, Fuso aim to achieve an "aggregate CO2 reduction of 7.5% by 2015." Click here to search for new Fuso Canter specs.